A minister in the Sri Lankan government has accused the police of arresting "five to 10 Tamil people" every day in the capital, Colombo, and its suburbs. Deputy Minister of Vocational and Technical Training, P Radhakrishnan, told the BBC Sinhala Service that over 1,000 Tamils are already in detention. He said that anybody carrying identity cards with addresses from rebel-held areas is immediately arrested. Tamil Tigers rebels are fighting for a separate state in the north and east. The minister's figures have been corroborated by Sri Lanka's Chief Justice, Sarath Nanda Silva, who told the media last week that nearly 1,400 Tamils are currently in custody. Mr Radhakrishnan is a leader of the Up Country People's Front (UPF) - which represents Tamils of Indian origin. He said that almost every person currently arrested in Colombo is an ethnic Tamil. "Being Tamils is the only reason for these arrests," he said. Mr Radhakrishnan stressed that he had no objection over suspected criminals being arrested. 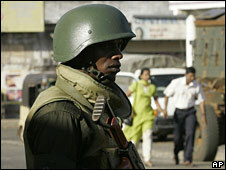 The Sri Lankan police recently ordered people arriving in the capital from the north and east to register. They conceded that the majority of these people were Tamils. The minister said he has received information that the police are using registration details to arrest Tamils in the capital. His accusation comes as the government is urging Tamils in rebel-controlled areas in the north to leave the war zone and go to government-controlled areas. The UPF has urged President Mahinda Rajapaksa to take immediate steps to rectify the situation. Mr Radhakrishnan's office says that it has also received information that at least 246 Tamil people have been abducted in and around the capital since January. He says that 67 of these people had so far returned, but no information was available about the fate of the others. Relatives of those missing have told the BBC that some of the abductions were carried out by people wearing security service uniforms. The minister accused "several Tamil armed groups" of also being involved in the abductions but was reluctant to name them. "We do not accuse the government but it has a duty to stop these abductions and find out what happened to those who were abducted," he said. Neither Inspector General of Police Jayantha Wickramaratne nor police spokesman Ranjith Gunasekara were available to respond to the allegations. But the government has repeatedly said that it was necessary to step up security measures after a string of bomb blasts and suicide attacks by suspected rebels - targeting public transport and political leaders - in recent months. Officials suspect that Tamil rebels infiltrate into the capital area disguising themselves as displaced civilians from the north and the east. The Liberation Tigers of Tamil Eelam (LTTE), as the rebels are known, have been fighting for a separate Tamil homeland in the north and east for 25 years. Human rights groups say about 70,000 people have been killed in what is one of South Asia's longest-running and most persistent insurgencies.